What is a child-friendly city? 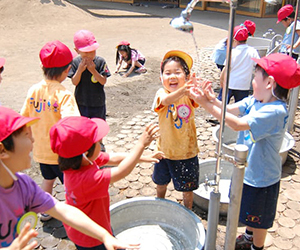 Why build a child-friendly city? At Fuji Kindergarten outside Tokyo, the oval roof is an endless playground and trees grow right through the classrooms. Designed by Tokyo-based firm Tezuka Architects, the Fuji Kindergarten is conceived as a single village for around 500 children. The interior is an integrated space with classrooms and recreational areas softly partitioned with furniture all open to nature. Read more about the design of the centre here or watch the TED talk. Block by Block is a global initiative that uses the popular video game Minecraft to involve youth in the planning process in urban areas by giving them the opportunity to show planners and decision makers how they would like to see their cities in the future. The project is a collaboration between Mojang, the creators of Minecraft and UN-Habitat. 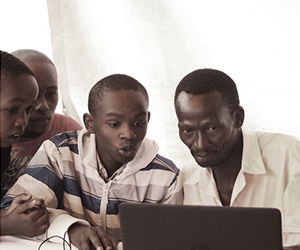 The first project was carried out in Kibera, Nairobi, one of Africa’s largest slums. Since 2016, the initiative has also raised funds for the improvement of public spaces worldwide with the support of Mojang and Microsoft. Click here to learn more. 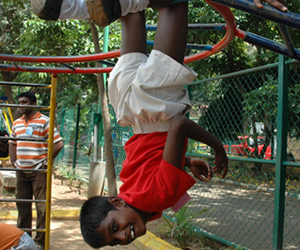 Kilikili is a non-governmental (NGO) organization set up by parents of children with disabilities in Bangalore, India in order to create inclusive neighbourhood play spaces for all children, regardless of their abilities, and to involve children in the design process. The success of this initiative led to a partnership with the Bangalore Municipal Corporation. Click here to learn more.